The brain is an incredibly complex structure. Its functionality amazes me more with each passing year. Not that mine is operating more effectively as time goes on: au contraire, it seems to baffle and bamboozle me to higher and higher levels. A garden is not complete without ducks or geese; this one is for you, Jessica! I found myself making the comment, this week, ‘what are gardens for, if not to evoke emotions?’. It was in response to someone defending the fact that amateur gardens with years of history are not necessarily inferior to those designed by the most expert professional. Despite my chosen career, I completely agree with his sentiment. They are often very different, but it doesn’t make them inferior. When I logged on to Twitter the following day, I noticed a tweet from garden designer, Lisa Ellis; one with such a beautiful photo and sentiment that I had recently retweeted it myself. It started, ‘gardens should evoke emotion….’. As original as I’d thought I’d been, it seems probable that Lisa’s words had stuck in my mind and subconsciously resurfaced as, I thought, my own. I imagine a team of minuscule, if very hard working, elves winding cogs and taking messages from one part of my brain to another; all sorts of activity going on inside my head that I have no control or idea of. I’m not sure whether to be in awe or down right scared but it does amaze me, how the brain works. It would be true to say that I visit quite a few gardens. Over time, you start to notice connections between those that really move you. You also notice that some quite beautiful gardens fail to move you at all, as you hunt for what it is that ‘evokes emotion’. One common theme is certainly a dedicated owner. An owner that is truly engaged with their garden; preferably in a physical sense – someone that is willing to get mud under their nails – but at least in an emotional sense. Someone whose eyes light up when you ask about it. Tieve Tara is one of these gardens. I had the huge pleasure of talking to both its owners, Judith and John, when I visited last weekend. John, sitting by one of the lakes soaking up the glorious view, was clearly delighted to share his garden with other keen souls. He was eager to know how I’d heard about the garden and what I thought of it; so appreciative that I’d stopped to say hello. Around another corner I met Judith, complete with plastic pots and gardening gloves. A lady who clearly gives so much to the garden, and gains so much in return. 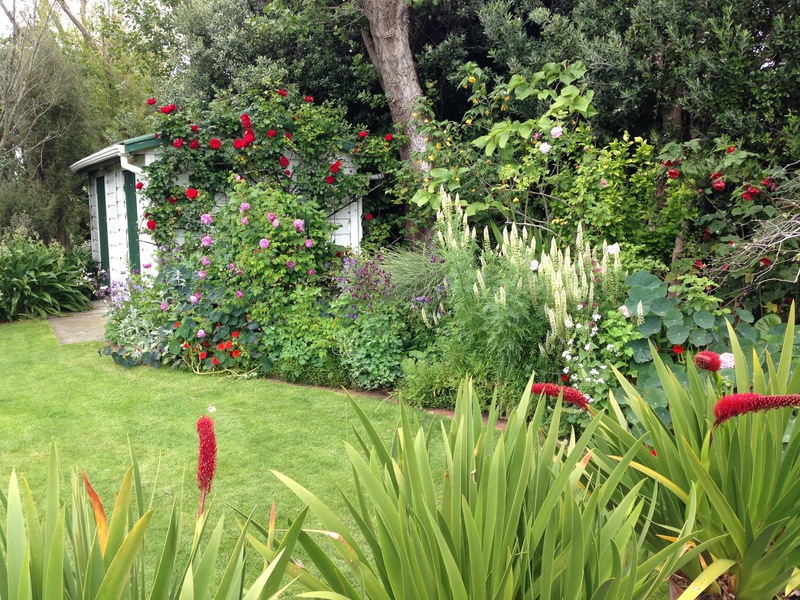 Just gorgeous to see how much pleasure a garden can give. I picked her brains for her gardening secrets and she generously shared her ideas, her learnings and her stories. It’s funny how meeting friendly owners affects how you view a garden. There is no question of this phenomenon. The passion and stories are a significant part of what can make an amateur garden one of the best you have visited, even if it does, on occasion, contravene every design principle known to mankind. But friendly, engaged owners were only a part of my affection for (the definitely not amateur) Tieve Tara. I would still have had to be dragged away, even if I hadn’t had the chance to meet John and Judith. I realised that established trees and and interesting topography are also repeating themes of my favourite gardens. Just as with Kiloren, in Crookwell, the play of light beneath the trees, the lush lawns, protected from the sun, and the depth of views, aided by sloping land, were all part of its magic. There is no doubt that beautiful light is on that list of common themes. 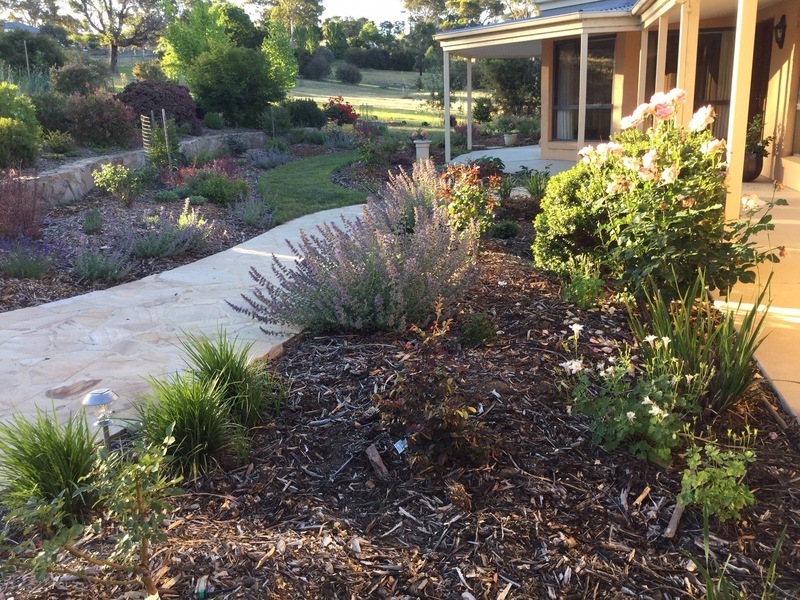 Add to that some clever uses of colour, plantings that merge with the surrounding bushland, beautiful water features and a few elements of surprise and you have yourself a pretty special garden. Lovely to see chooks wandering amongst the vegies; what a picture of the good life! Thank you, Michael, for recommending I visit. It’s certainly one to add to the list of emotion-evoking gardens; emotion-evoking in the most conscious of conscious ways. No elves involved. I do hope you enjoy the photos. Simply stunning! My daughter says she could easily do her school work at that desk….this is her favourite so far! Definitely one for our list. I keep looking at it and wondering what it is that makes me like it. I think as you say the dappled light, the way the plants hug the bench seat and the selection of plants. Love it! If I lived there, I’d be very happy to share my desk with your daughter; she clearly appreciates a good garden! How much work would we actually get done though? It is such a serene setting, just beautiful in every way. If only we all had 7.5 acres, dozens of mature trees and the ability to create something as gorgeous as this. Generous owners who let us visit at least allow us the pleasure of dreaming! It’s beautiful. I love the feeling of surprise in a garden, moving from one area into a totally different one. Even better if we are taken on a journey through shady paths with just the tiniest glimpses of what is to come. How I wish I had somewhere flat enough for a lake and, of course, the geese. Thank you Janna. My face broke into a smile the second I saw them! Your first sentence is really all I needed to say for this post. A simple fact. And those geese. Aren’t they gorgeous? I’m quite scared of them but absolutely fixated somehow. Their shape is amazing, their quack is amazing, their gracefulness in the water, somewhat greater than my own! So glad it’s not just me. This one is on my list too now Janna – Oh how much we rely on you to ‘dig-up’ (s’cuse pun) these stunning places for us! My type of garden. Enjoy your trip to NZ, can’t wait to hear more. I think it is almost everyone’s type of garden. Whatever your style, it is virtually impossible not to love. I’m thinking trees, trees, we need trees at our next home. Judith and John have such a wonderful balance of light and shade; flowers and foliage. Pure delight. Thanks for your good wishes; I’m scared and excited! A wonderful garden, and some thought provoking ideas. I agree some gardens do evoke emotions, and friendly enthusiastic owners really make a garden. A passion for gardening is a shared joy. Thanks for your comment, Gerrie. I quite agree, gardening would not be the same without the joy of sharing it with other, like-minded people. If only I had known that you were one of those like-minded people when I lived in Canberra! I was there from 2010 – 2013. It’s a great city, isn’t it? Not without its challenges from a gardening perspective, though. Hi Janna, I just found your site and I’m so happy. I’ve been trying to find someone talking about gardens the way you do: full of passion, but like a friend in my own garden, lots of stimulating things to think about and look at, gardens from all over the world and down the street. Thanks so much for your generous and enthusiastic writing. Hi Nicola. Thanks so much for your lovely message. I’ve just got back from hiking in New Zealand and it was the nicest thing to come home to! I’m so glad you have enjoyed seeing some of the gardens I have visited and I do hope you enjoy future ones too. I’ve got so many I want to share. Thanks again for your very kind words. I look forward to hearing your thoughts as we explore new places ‘together’.